It’s Boston’s favorite time of the year! The days are getting warmer and longer, the Red Sox are back at Fenway and we’re all ready for a three day weekend! Patriots Day may traditionally be a local holiday commemorating the anniversary of the Battles of Lexington and Concord but in Boston it is more fondly known as Marathon Monday! The Boston Marathon has been run on Patriot’s Day since April 1897 and has become one of the most beloved events in the city. We can’t wait to cheer on all the runners on their BIG DAY! We know there is a lot of prep that goes into the 26.2 mile race. Including carb-loading on the days leading up to race day! 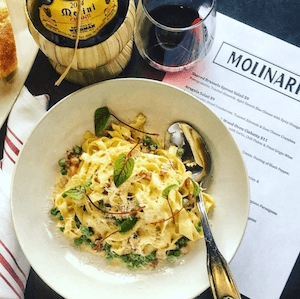 We’ve highlighted all of our favorite places to pig out on pasta in Dot – whether you’re a runner or not! Pig Out: “Sunday Dinner” which includes Linguini, Molinari’s Marinara, and Ida’s Meatballs. dbar – 1236 Dorchester Ave. Pig Out: Mac & Cheese with clothbound cheddar, caramelized onions and breadcrumbs. Pig Out: Sicilian Seafood Cioppino with swordfish, baby octopus, scrod, scallops, salmon, clams and mussels all simmered together! Where are your favorite spots for pasta?